Les carroz is a small ski resort located in the heart of Haute-Savoie area, situated in the middle of The Grand massif, which is the 6th biggest skiing area of France. The Grand Massif, it’s 5 ski resort linked together, from 700m to 2500m altitude, with Flaine, Morillon, Samoens, Sixt and els Carroz. It’s 143 km of slopes, 67 skis lifts and 362 snow canons. The village ensures families a warm welcoming and always pampers kids, teens and adults with differents activities and festivities in its streets, organized by the local ski schools and clubs. Les Carroz is the fastest and the shortest way to enjoy fresh air from summits and skis slopes. 10 min away from the highway, and less than one hour from Geneva international airport, or 2hours away from Lyon. Parkings are free in Les Carroz. 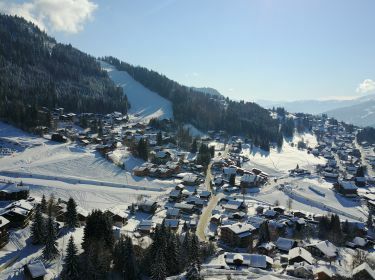 Taxis and private transport companies can help you to come to Les Carroz.